//Mr. Thomas adds a layer of Tungsten Carbide (used for heavy mining tools) to the cutting edge that's electrically infused onto the Titanium which creates microscopic grains that allow the knife to cut through some of the most extreme materials (Kevlar) & still keep going. Some people equate his knives to owning a pocket chainsaw. //So these knives perform better with draw cuts not push cuts. //Tactical folder from veteran knife maker Warren Thomas. //Titanium because it is soft easily makes a razor fine edge that can catch hair but the edge doesn't hold long. The positive here is that outdoor knives usually are valued for their toughness to avoid breaking from impacts & the toughest metal is Titanium (4x the toughness!). A titanium blade will bend before breaking (watch our vid testing the Shikra). Chisel grinds are sought after by Special Warfare groups & can be found on knives like Emerson customs. The reason why is Chisel grinds besides being simpler to sharpen they also perform very well for slicing tasks because of the lower edge angle. The chisel grinds (especially those that only have a primary bevel, meaning zero chisel) cut flesh easily. The chisel is made for tactical use. A secondary bevel is usually added to help strengthen the edge stability for more everyday utility tasks. Recurve blades can be found culturally & historically as farming tools because of their ability to grab & shear. 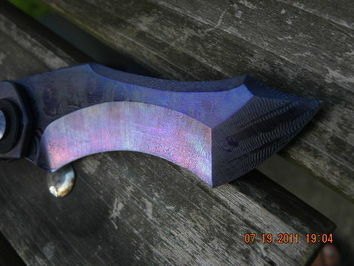 Used by Filipino martial artists because the recurve catches material in it's curve, the recurve blade is now a key part of tactical knife design & is used in special forces fighting styles such as Sayoc or Atienza Kali & by other knife makers such as RJ Martin. //If you could ask any special forces individual or backpacker what they would like their gear to be more they would answer: lighter & less maintenance. The second is an important aspect because maintenance requires more things to carry & rely on if the knife requires it. Warren Thomas knives take this idea to the extreme by utilizing Titanium (which is lightweight & corrosion proof) to make every aspect from the screws to the handle & blade thus removing all aspects of maintenance. This means a knife that can go anywhere without a worry. Divers, Navy Seals & individuals in humid climates seek after this material because of it's anti corrosion traits & also because it is non magnetic. Typically Titanium diving knives lack the edge retention of normal ferrous metals but Mr. Thomas fixed this by creating his method of adding Tungsten carbide to the cutting edge thus giving the best of both worlds. Teflon washers also require no lubrication but of course work better with some oil. Because the construction of the knife is titanium & g10 only including the stop pins & stand offs there is close to .7mm of flex possible in the handle. The lock up of his knife is extremely solid but the best way to describe the knife is to relate it to a Ferrari. It is designed as a specialty car that has certain high performance qualities but is light. This doesn't mean a Ferrari isn't built tough but it is in a different category. WT folders have very high tolerances & lock up is very solid but are in a different category to knives with steel stop pins & hardware. So bear in mind these knives can flex slightly & are not meant for heavy use. They will flex before breaking in comparison to other knives made out of traditional steel components but the lock bar can move inwards with the harder pressures being applied. A great option if heavy use is desired is to look at WT EDC sized fixed blades since they will still weigh less than standard tactical folders & will outperform heavier more expensive heavy use tactical folders.